Clean properties are a lot more desirable when it comes to letting. And in our capital, people are particularly picky. This is why when it comes to the end of tenancy cleaning in London, tenants and landlords alike try to do their best. However, just like with another cleaning work in our capital, end of tenancy cleaning in London can take up a lot of valuable time. And most tenants would prefer not to bother with it at all. Yet they are expected to leave the property in a pristine state. If you have found yourself in a similar situation, worry not. Our company offers professional and timely end of tenancy cleaning in London. With our experts, landlords and tenants alike can continue on with their regular schedule as per usual. Our end of tenancy cleaning in London team will make sure that everything is going as planned. Landlords: All property owners want to have their possible tenants arrive at a neat and tidy premise. The easiest way to get this sorted is by hiring a cleaning company, specialised in the matter. As already mentioned, residents of our capital tend to be much pickier. That makes the end of tenancy cleaning in London a whole different service to what you will get offered in other places. Everything has to be more thoroughly examined, and attention needs to be given to all the details. Tenants: Most tenancy agreements require renters to “return” the property in order, should they wish to get their deposit back. And that is precisely where our teams can help you. As an established provider of end of tenancy cleaning in London, we take it upon ourselves to oversee the process. You can go about your day and come back to a shiny property, ready to be returned. And all of this will not require you even to lift a finger. For landlords, keeping a property occupied by happy tenants is essential for getting a good ROI. And while some might think that adopting the DIY approach will be the best choice, as it does not seem like it costs money straight up, they are wrong. Even if you did not plan to do anything with your time and had the day off, you can also focus your attention on something more productive instead. Not everyone equates time to money, but those who do are not far from the truth at all. So, while choosing the DIY approach for your end of tenancy cleaning in London might seem cheaper, it is not. 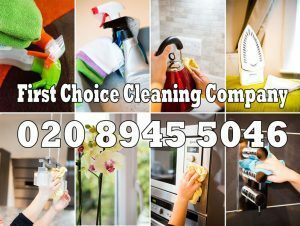 At First Choice Cleaning Company, we understand that effective end of tenancy cleaning in London is of utmost importance to your personal well-being. The two most sought-after services when it comes to the end of tenancy cleaning in London are Kitchen Cleaning and Bathroom cleaning. One of the most important rooms for possible tenants is the kitchen. It needs to look hygienic, shiny and well-kept. This requires a lot of attention to detail that few companies, providing end of tenancy cleaning in London are offering. Every surface needs to be looked at, washed and polished. Cupboards need to be emptied out of old food and cleaned thoroughly. The sink requires delicate, yet through attention as well. The proper use of scale removers and stainless steel cleaners is a must. The list goes on, spanning over the entirety of your kitchen equipment and surfaces – walls, flooring, utensils, cooking equipment, storage equipment and furniture. The bathroom is the second most crucial part of our end of tenancy cleaning in London service. If you cannot offer a clean and good-looking bathroom to your future tenants, you are much less likely to strike a deal. Shower screens need descaling and polishing. Wall tiles require soap scum with any mould removed from the grouting between the tiles. Cleaning with antibacterial or fungicidal cleaners may be necessary if mould is found. All of the chrome work requires careful brushing. Our thorough approach has proved invaluable for becoming one of the most sought-after providers of end of tenancy cleaning in London. With our specialised services, your property can benefit from the best end of tenancy cleaning in London, 7 days a week. Our professional team responds quickly and provides immediate service. We specialise in Moving in as well as Moving out end of tenancy cleaning in London. Our teams require a 24-hour heads up so the service can be properly arranged. With our service package, you can rest assured that the premises will be spotless and ready to receive new tenants as fast as you can find them. Our teams, providing end of tenancy cleaning in London are fully insured and professionally trained. Not matter if you or your roommate are moving out, you can always expect exceptional results when it comes end of tenancy cleaning in London. Following the best practices for end of tenancy cleaning in London, our experts will ease your burdens and free up your schedule. With us, you never have to worry or set time aside for cleaning tasks. Book a complimentary consultation for end of tenancy cleaning in London TODAY and enjoy your free time while our experts do the job for you. Should you wish to know more about our services, email us or simply get in touch via phone – 020 3819 5735.